RIS actively involves parents in their child’s education as research has proven that when parents are actively involved, the child does much better at school and achieves greater success in life. Our Parent Engagement Programme provides parents the required guidance, understanding, infrastructure, resources, parenting tips, support groups, informational workshops, volunteer organisations and channels to assist them in participating in their child’s learning and school events. At Regent International School, we believe that effective communication among parents, students, teachers and administrators promotes high standards of conduct and achievement amongst students and creates a better learning environment. 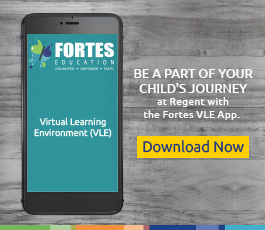 The Virtual Learning Environment (VLE) is a unique technological initiative of RIS to digitally keep in touch with students and their parents. Parents and students can download the VLE mobile app on Apple and Android devices. The VLE provides constant updates about a child’s progress and performance and various activities at school such as homework, trips and reports. This seamless online communication has helped develop a strong partnership between the school and its parents. Parent Teacher Meetings take place once a term and consists of consultations with the teacher where parents have an opportunity to discuss their child’s progress, outcomes, targets and how to support their child’s progress. Furthermore, every Thursday afternoon is a drop-in session (1:30 pm onwards) whereby Primary parents can interact on a regular basis with class teachers. Workshops are held regularly across each term where parents learn of their child’s programme of study so that they can actively participate in supporting their child's education. 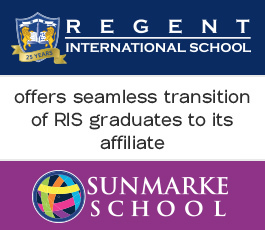 Friends of Regent International School (FRIS) is a platform for parents to actively participate in their child’s education. Each parent automatically becomes a member of FRIS and is welcome to contribute in their own capacity. Parents can volunteer to host activities, organise events, and contribute during fundraises or in any way as they see fit to support the school community. FRIS has successfully organised many fundraisers, charities, social activities and other community events at RIS. If you would like to find out more, please contact the parent liason officer at plo.ris@risdubai.com, and also come along to a FRIS meeting held fortnightly at the school to learn how to contribute to your child’s education and school events. RIS has an active Advisory Council called the RISAC where parents have representation and are able to voice their concerns to the school in a formal manner. In this way, a constructive dialogue is maintained between all stakeholders in the school. Twice per year, the Achievement Centre hosts Parental Engagement. This week features small-group interactive workshops, tailored to respond to the needs of the current demographics. Additionally, parents are invited to attend their child’s 1:1 and/or small group intervention sessions, to see first-hand how our supportive teaching strategies and activities can facilitate accelerated progress for these students. Opportunities for parents to attend school events including sports, prize days, and cultural fairs to interact with the staff, students and community. Expert speakers to help parents understand learning and child development. Parent workshops or meetings (coffee hours, focus groups, informational sessions, etc.) on helping children to learn and succeed. Encouraging the parent to have a regular dialogue with his child about his learning, study programme, activities, plans, hopes and day at school. Encouraging parents to share activities with their child such as reading together, solving problems together, conducting science experiments, engaging in home building activities, cooking together and the like. Providing positive feedback by praising the child’s efforts and progress. Being a role model for the child by displaying a positive attitude and perseverance in the face of challenge.